As customers, we really only expect the most basic level of service. We find a product, pay for it, and it shows up at our house a few days later. Transaction complete, right? When we do experience the minimum requirements, consumers are happy enough. We’re willing to leave great reviews based on minimal interaction. With so many meh experiences getting good attention, why would any ecommerce retailer want to go above and beyond? There are those companies that do take customer delight very seriously. After dealing with one of these people-pleasers, a meh experience suddenly isn’t enough. What can you do to provide consistent delight? Here are some examples from real ecommerce companies. The clothing and home décor giant doesn’t have to do much more than they already to do to delight consumers. They have an excellent and storied reputation that’s been decades in the making. When buyers receive the quality products in the mail, they’re already just thrilled that they get what they need without fighting department store crowds. Laura Ashley still takes their responsibility to the customer to the next level. After ordering a bedding set from the online store, one customer received a special surprise two days before delivery. A thank you note was enough, really. More than enough, to be honest. But they took their gratitude one step further and included a set of cozy Laura Ashley lounging socks. When it comes to ordering equipment and apparel for international sports—specifically the Irish sports of hurling and Gaelic football—O’Neills generally has the monopoly. With that kind of exclusivity, the company could pretty much do what they want and still sell to American clubs and teams that want their own jerseys and kits. Instead of taking one club’s money and running, O’Neills took several large extra steps to make sure one American club stayed as happy as possible. The Nashville Gaelic Athletic Club ordered tracksuits (along with several other items), to be shipped from Ireland. When O’Neills noticed a small defect in a few of the tracksuit pants, they notified the club immediately about the problem, sent the flawed items as extras, and then manufactured perfect pants to send over in addition. All without any suggestion or complaint from the club. Sometimes customer delight happens even when there’s a problem. ModCloth managed to make one customer’s day even after she contacted them with a complaint. 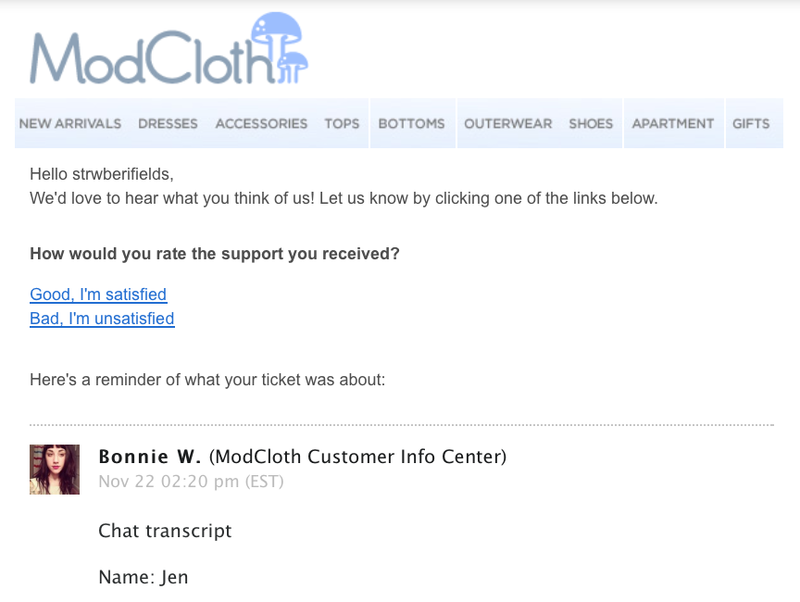 First, ModCloth offered a chat option for customer service. Anyone who’s spent hours waiting in queue after calling knows how hard multi-tasking is when you’re waiting for the elevator music to end and a real person to pick up. Just offering an option that allows customers to keep working while waiting is wonderful. Then, however, the chat operator met and exceeded the customer’s expectations. It’s always nice when customer service representatives make things right, but it shouldn’t be something to celebrate; it should just be the norm. However, when ModCloth contacted the customer to ask how the customer service representative handled the issue, they hit the winner button. First, asking is great! The real excitement set in when they included a transcript of the chat. Not only did they remind the customer of the issue, how it as resolved, and whether ModCloth kept their promise, but really put themselves on the spot to do so. What if the customer remembered the experience differently and was reminded of a terrible experience? ModCloth took the chance at their own expense, and that’s where true customer delight takes shape. How can you go above and beyond for your customers? We’d love to know your thoughts, from the smallest to the largest. Anything goes, so share with us in the comments.